I'll be the first to admit that I tend to struggle when it comes to buying gifts for men. I'm always brainstorming idea's and making notes of what to buy for Nick, my brother, my Dad and my Grandad. One thing that most of the men in my family have in common is their love of superheroes. With Fathers Day and Nick's birthday right around the corner, and with Marvel being so popular I thought I'd put together a gift for all those Superhero obsessives out there. It seems that the world has gone Funko Pop crazy over the past couple of years. We aren't collectors ourselves but I can totally understand the fascination with them. They've created Funko Pops for so many characters, actors, artists, sports stars, icons. This is why they'd make a great gift, even if you aren't a collector yourself. I don't think you can go wrong with a brand new mug! Our mugs and cups are always getting chipped or broken in the dishwasher, and those which manage to escape unscathed usually end up at Nick's work, never to be seen again! A cup of coffee in an Avengers mug, what more can a fan want? Adult colouring books are something else which have risen in popularity lately. They are said to relieve stress as well as keeping you entertained and your mind busy. I'm sure having an Avengers-themed colouring book would encourage even the burliest of men to give it a go! We are yet to watch this movie which is a surprise because we love Ant-Man and we are huge fans of Paul Rudd too. I'm planning on buying it with the latest Avengers movie for Nick for Father's Day. We've agreed to watch them that night, feet up with a big bowl of snacks. I'm just hoping that the kids sleep and let us watch the films without any disturbance. That would be a great present for him actually, a few hours peace! Last, but certainly not least we have the licensed Infinity War t-shirt which I think is awesome! It features all the characters we know, love and loathe and is perfect for all the Marvel fans out there. Nick can be quite picky when it comes to what he wears and he usually avoids t-shirts with slogans or large character prints. I think he'd love this one though as it's quite subtle and the colours work really well together without being too in your face. 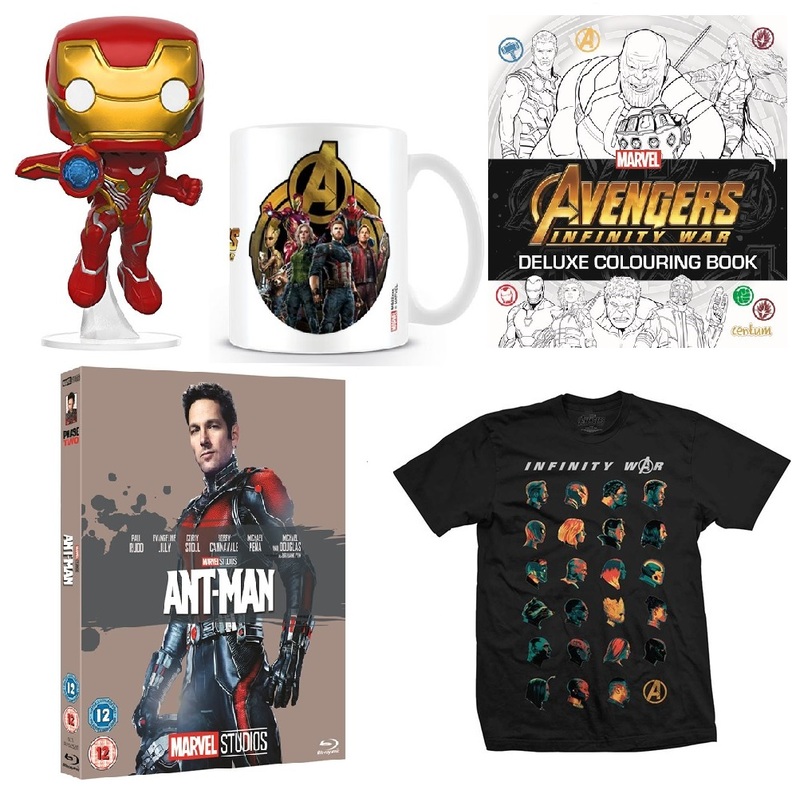 Do you have any Superhero fans in the family and would you consider any of these gifts for Fathers Day? I agree that it can be difficult to choose gift items for men. So thanks for providing ideas from time to time. Personally I tend to like to try and choose items appropriate for the situation / Celebration and / or the recipient of the gift /s. Superheros have become quite popular with children over the last couple of years. There is a Superheros Day, which I believe is the 4th May. I can recall my niece visiting her Dad, at our Mum's a few years ago. It was Fathers Day and she had a Fathers Day gift for him. He was at our Mum's, as was his routine on a Sunday. He was delighted with his visit from his daughter, and delighted with his Fathers Day gift. It was recognition of his roles as Father and Grandfather. We were delighted, and thrilled to share in his pleasure and delight. I am so pleased that Fathers Day has become more recognised, and Celebrated. As the brother I refer to unfortunately died last year :- It is nice to have some memories of times when he spent time with us and experienced some happiness. Some great ideas, I definitely need to stick to a budget this year!